Celebrating 13 years! 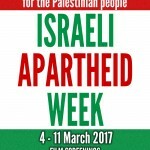 Israeli Apartheid Week is an annual international series of events (including rallies, lectures, performances, films, multimedia displays and protest actions) held in cities and campuses across the globe. Each year, Israeli Apartheid Week takes place across more than 150 universities and cities. It aims to raise awareness about Israel’s ongoing settler-colonial project and apartheid policies over the Palestinian people. IAW aims to raise awareness about Israel’s apartheid policies towards the Palestinians and to build support for the growing campaign of Boycott, Divestment, and Sanctions (BDS) against Israel. Please join us in making the the 13th Israeli Apartheid Week one of the biggest yet. Below you will find a full listing of events we have organised during this year’s Israeli Apartheid Week (plus some events not part of IAW but which may be of interest our supporters).